Business blogging "best practices" instruct bloggers to include a relevant call-to-action at the bottom of every blog post. This is nothing groundbreaking -- it's how you convert visitors to your blog into valuable inbound leads for your business. But are those end-of-post calls-to-action (CTAs) really the best option? After all, any conversion rate optimization expert worth their salt knows to take industry "best practices" with, well, a grain of salt. Over the years, I've spent a lot of time analyzing HubSpot’s Marketing Blog. While I've been able to identify which individual blog posts generate the most leads, I’d never dug any deeper to understand which specific calls-to-action within those blog posts people were actually converting on. When we introduced a new type of CTA to our blog posts as part of the historical optimization project last year, we ultimately doubled the conversion rates of the posts we added it to. So it got me wondering: Are end-of-post CTAs really the best way to generate leads from our blog? How do different types of CTAs within a post compare? To get a better understanding of where our blog leads are coming from on the post level, I analyzed a cohort of 11 posts on the blog that generate an above average number of leads every month. To do so, I created unique tracking URLs (using HubSpot) for the CTAs used within each blog post. Essentially, any individual link within a blog post that led to a landing page got its own tracking URL. So for a post with 10 different CTAs, I created 10 unique tracking URLs. Then I replaced the links within those posts using my unique tracking URLs, and waited four weeks to collect data. End-of-post banner CTAs contributed an average of just 6% of posts' total leads. Crazy, huh? Actually, when you think about it, it’s really not that surprising that these CTAs get very little play. We'll talk about the reasons why in just a minute. Here’s how an end-of-post banner CTA might look on our blog. It's essentially a full-width banner CTA at the very bottom of the post, and it typically includes some copy, an image, and a "download" button. So, if our leads aren't coming from the CTAs at the bottom of our blog posts, where are they coming from … and why? 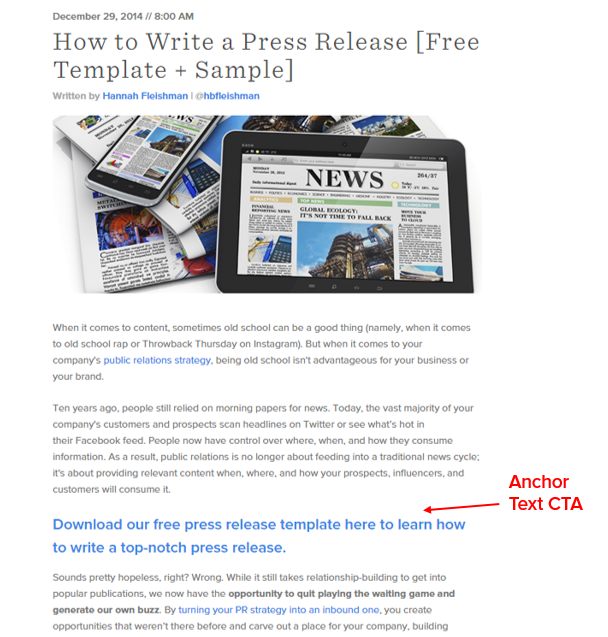 Anchor text CTAs are responsible for the majority of our blog leads. An anchor text CTA is the term I’ve given to a specific kind of text-based call-to-action. It’s a standalone line of text linked to a landing page, and it’s styled as an H3 or an H4 to make it stand out from the rest of the post's body copy. On HubSpot's Marketing Blog, we mainly use these between the post's first few introductory paragraphs, but we may also add them throughout the post in cases like this. In every single post we tracked, the anchor text CTA was responsible for the largest percentage of that post's leads (by far). In fact, between 47% and 93% of a post's leads came from the anchor text CTA alone. And the data gets even more compelling when you factor in the anchor text CTA's cousin -- the internal link CTA. An 'internal link CTA' is my term for what is essentially an anchor text CTA, but rather than being styled as an H3 or an H3 in a separate line of text, it's positioned within a paragraph block, making it blend in more with the content around it. It could be something as discrete as hyperlinking a keyword to a landing page like you see in image A below, or something more direct like you see in image B (which we found to be the most successful type of internal link CTA). Between 83% and 93% of each post's leads came from anchor text CTAs and internal link CTAs. 1) People tend to develop "banner blindness," and these text-based CTAs don't look like ads. The fact that these anchor text CTAs blend in more with the rest of the post may be one of the reasons they perform well. Like I mentioned earlier, because people are so accustomed to seeing and ignoring ads, they're more likely to ignore CTAs that resemble them. I’d say this is especially true for marketers -- and marketers are the target audience for this blog. And aside from the fact that anchor text CTAs are slightly larger than the rest of the blog's body copy, there are really no bells and whistles or gimmicks associated with this type of CTA. Because they're so straightforward, people may also perceive them as being more genuine than the typical image-based, banner CTA. 2) Readers rarely make it to the end of a blog post, so showing relevant CTAs sooner is more effective. There are quite a few studies out there that show that most people don't read articles in their entirety. In fact, scroll map tracking we’ve done on this very blog supports this data, too. We recently tracked a bunch of blog posts in Crazy Egg, and the scroll maps all show that our readers rarely see the CTA at the bottom of posts because few of them even make it to the bottom. And those who do make it to the end seem to bounce as soon as they read the last line of text, completely avoiding the image-based CTA at the bottom -- which supports our first theory about banner blindness. 3) Relevant anchor text CTAs give visitors exactly what they were searching for right off the bat. Many of our top lead generating posts have highly relevant anchor text CTAs that include the exact keywords visitors were searching for when they found the post. This is one of the main goals of our historical optimization project: Knowing that the majority of the blog's new traffic and leads comes from organic search, we've optimized our highest traffic posts using the keywords they rank for. To explain using an example, let's say you search for "press release template" in Google, and you click on the first organic result, which is currently our blog post about how to write a press release. As a searcher, the next thing you'd probably do is quickly scan the post to see if it satisfies your search. 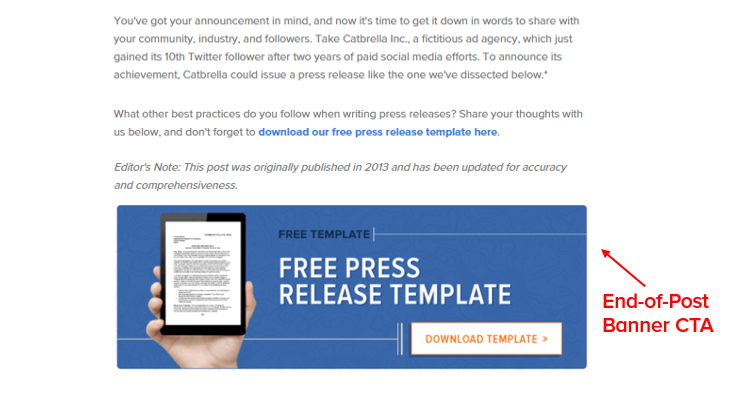 Now, if one of the first things that catches your eye is an anchor text CTA that reads, "Download our free press release template here" -- which happens to be exactly what you were looking for when you searched "press release template" -- then there's a pretty good chance you're going to click on it. In other words, the anchor text CTA works really well in this case because it satisfies the visitor's need right away -- within the first few paragraphs of the blog post. What's important to emphasize here is relevancy. 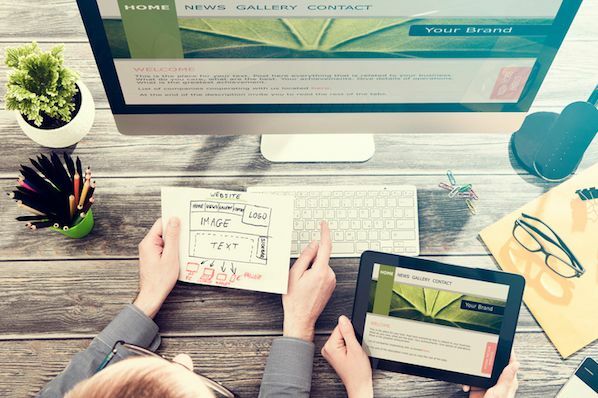 The more relevant the anchor text CTA is to what the visitor is looking for, the better it performs. This means that simply adding an anchor text CTA near the top of every blog post won't necessarily mean it will generate a ton more leads; the relevancy of the CTA to the content of the blog post is a critical factor in its success. In analyzing the varying lead gen effectiveness of different posts that include anchor text CTAs, it's easy to identify why some perform better than others, and it all boils down to how relevant the anchor text CTA (and thus the offer it promotes) is to the content of the blog post. Based on my analysis, slide-in CTAs do seem to perform better than end-of-post CTAs. This makes sense since visitors see them sooner (they slide in at about 25%-50% of the way down the post), and they're more interactive (they slide out at the visitor and catch their eye). That said, they still don't come close to matching the effectiveness of text-based CTAs. Once we knew how valuable anchor text CTAs were for generating leads from our blog, we doubled down and added them to about 80 other old, high-traffic blog posts that didn't already have them. The view-to-lead conversion rate of posts that didn't previously have an anchor text CTA increased by an average of 121% when anchor text CTAs were added. While we now know how valuable anchor text CTAs are, our team is still very selective about which posts we add them to. We mainly target old posts that rank in search because it allows us to identify which keywords searchers are using to find those posts and match that intent with a highly relevant offer/anchor text CTA. We also know that the majority (68%) of traffic we get to our blog comes from organic search, and the majority of that organic search traffic (74%) is made up of brand new site visitors who can't possibly be leads in our database. This means our older posts, which pull in all that organic search traffic, have the highest potential to generate new leads. On the flip side, we know that the majority (60%-70%) of initial traffic we generate to a brand new post we publish comes from our email subscribers. We also know that 80% of the email traffic to the blog is made up of returning visitors, and 79% of our email subscribers are already leads in our database. In other words, our brand new content doesn't have as much potential to generate leads because of the type of traffic it attracts. As a result, we purposely limit our use of anchor text CTAs on brand new posts, because most of the traffic we get to those posts are A) already leads, and B) some of the biggest fans of our content, whom we want to have the best possible user experience. One Final Note About "Best Practices"
Remember, while we've found that end-of-post banner CTAs don't perform very well for our particular blog, that doesn't mean they won't for yours. Each blog is unique, attracting different types of audiences and publishing different types of content -- among a slew of other variables. In a perfect world, every blog manager would run this CTA study and conduct a lot of testing themselves to determine the best conversion strategy for their individual blog. But it's also important to understand that not every blog has access to the resources necessary -- like a dedicated optimization team and a high volume of traffic -- to do a lot of in-depth testing. So while conversion rate optimization experts warn against relying on "best practices," taking direction from them isn't a bad approach when you're just getting started with a new tactic or you don't have a lot of resources, time, or traffic to test things out for yourself.